Goal Minded Girl: Kiss It Goodbye Challenge! I have exactly three months until I am on a cruise to the Bahamas with some good friends. My goal is to lose 25 pounds before that point. That's totally doable if I set my mind to it and work hard. If When I reach my goal, I will be the smallest I've been since 6th grade. That is completely insane for me to even fathom considering that I am in an adult body (and a few inches taller) now versus an adolescent ever changing body. Does that even make sense? Anyway. That's my goal (not my final goal but my next goal). And I'm going to reach it. When I reach it, I will have lost 103 pounds total. So I will gladly KISS IT GOODBYE! Who wants to join me? I think an accountability group would be awesome. We could do weekly check ins either through this blog or through a private Facebook group (which I think would be cool and easy for everyone to use since most people have Facebook and all). You may have more than 25lbs to lose or you may not even have 25lbs...but we could be an encouragement to each other to keep going to reach whatever goal you choose to set for yourself. Since my blog posts usually happen over a span of a couple hours lol I went ahead and started the Facebook group. 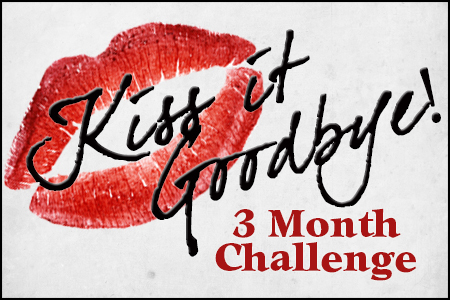 If you want to join just search Kiss it Goodbye- 3 Month Challenge and ask to join. We'll keep it clean and no drama or judgments. Goal for this next week. Walk (at least) every day. Add in strength training at least twice a week. I've printed out side by side progress pictures to hang on my fridge and my bathroom mirror to remind myself where I once was and how far I've come but I'm not stopping yet. I'm so close to my victory...I can taste it.